When you are sewing, gathering fabric is a very common task. Sewing perfect gathers and ruffles is possible when you understand how much fabric is required and the various ways ruffles are formed. The method you use to gather fabric will depend on many factors. Your goal is to create even full gathering on anything that requires you to gather fabric. The amount of fabric you will be gathering is built into the pattern or decided by you. Note: Stitched examples in the photos are done in contrasting thread for visibility. On light to medium weight fabric, using two or three rows of basting stitches can achieve an evenly gathered ruffle of fabric. Rows of sewing machine basting stitches are sewn with quality thread that will not break when you tug the thread to gather the fabric. These basting stitches will not be seen and can be sewn with thread that does not match your fabric if you are running low on the matching thread, just be sure the thread will not show through the fabric. While sewing these rows of basting stitches, do not back stitch and leave relatively long tails of threads at the beginning and end of the area you will be gathering. 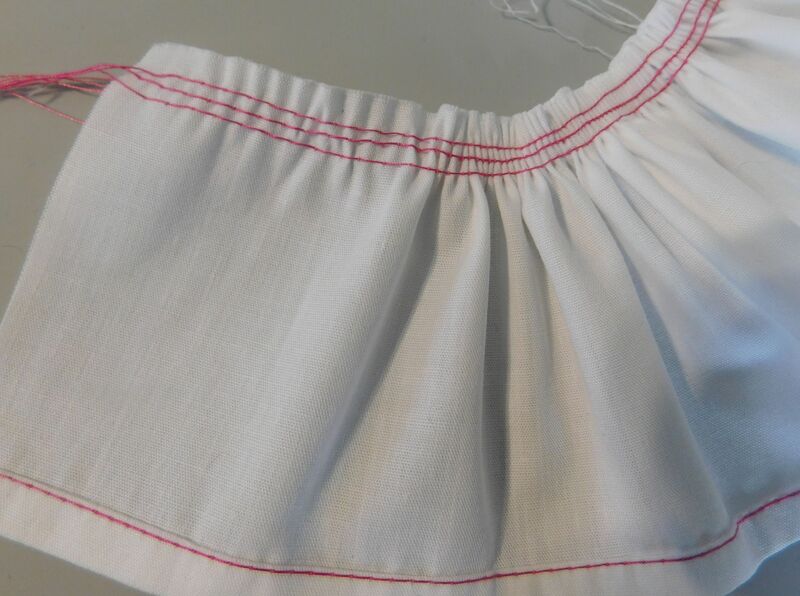 Make the first row of stitching, as close as possible to the seam line of your ruffle, but in the seam allowance. Make a second row close to the first row on the seam allowance. If at all possible, make a third row of stitching. Choose the upper thread or bobbin thread, gently tugging the threads to gather the fabric. Always tug one or the other but not a combination of both the upper and lower thread in order for the threads to move and gather the fabric. This method works exceptionally well on heavy fabric, rigid fabric and home decor fabrics. If the fabric is heavy and the thread, even if you are using quality thread, would break while gathering the fabric, you will want to experiment with this method to gather fabric. Use a strong string that will not break when tugged on. Use a length of the string that is a bit longer than the area of fabric you plan to gather, so that a tail of the string will be at the beginning and end of the area being gathered. Use a wide stitch width setting on your sewing machine for your zigzag stitch. Lay a string or heavy thread on your fabric, centered under your presser foot, on the seam allowance just inside the seam line, so that both sides of the zigzag stitch will not show in the seam line..
Zigzag over the centered string, being careful not to catch the string in the stitches. Tug on the string to achieve your gathers. Make sure you don't pull the opposite end through in to your zigzag stitches. A ruffler presser foot is a special presser foot. It will ruffle the fabric as you sew it, keeping the ruffle perfectly even. This type of foot is available at your sewing machine dealer. The dealer will need the make and model of your machine to provide you with the correct ruffler foot due to the variations in shank height. I know that both of the ruffler presser foot, that I have purchased came with very vague instructions. There are many different ways to achieve the results you want. Most ruffler's have two different parts on them that are adjustable, and should be pointed to in the directions. By adjusting the stitch length on your sewing machine, you are able to control the adjustments further. Using a ruffler permanently sews the gathers in place as the sewing machine moves the fabric. Using this method would not be for following a pattern where you are matching dots or pattern markings and then adjusting the ruffle. It is a fantastic method for things like attaching a ruffle to a curtain panel. Using a ruffler presser foot for the first time should definitely be practiced on scraps of fabric before you sew with the ruffler on the actual project. Always test the setting on a scrap of fabric that is the same as what you have allowed for gathering the fabric. If you have allowed 2.5 times the fabric for a ruffle, cut a 12.5" scrap and make adjustments for the scrap to gather up to a 5" piece. Older sewing machines may have a ruffler attachment that is more than a simple presser foot. The manufacturer or sewing machine company of that attachment should supply direction for using that attachment. A serger witha diferential feed option can be set to gather the fabric as it passes under the presser foot of youro serger. Experiment with machine adjustments and settings on scraps of fabric that are similar to your project before attempting the actual project. Refer to the manual for your serger for the best instructions to making adjustments.